About the CR Clean Air Group, LLC. A contract sterilization service uses a single-stage scrubber to convert this hazardous gas to inert ethylene glycol. ETO Sterilization Inc. provides contract sterilization services for hundreds of northern New Jersey customers, concentrating on spices and herbs, cosmetic ingredients and medical supplies. Two of the largest ethylene oxide sterilization vessels in the world are in operation at their Linden and Carteret, NJ, facilities. The company had to scramble in the mid-1980s when new federal regulations banned emissions of the gas. ETO Sterilization turned to the CR Clean Air Group for a custom-designed scrubber for each of the installations. The Group guaranteed better than 99% contaminant removal, and could show an excellent track record of acceptance by state regulatory agencies. 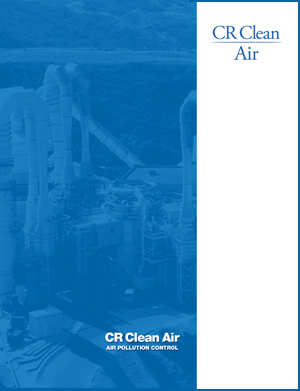 The systems were installed in 1987 and have demonstrated “very good” performance according to the CR Clean Air Group. EtO Hydrolysis: Ethylene oxide (EtO) is used for sterilizing materials and products that would be damaged by traditional methods involving heat, moisture or radiation. The sterilizing atmosphere depends on an alkylation reaction that prevents microorganisms from reproducing. ETO Sterilization uses ethylene oxide gas diluted with refrigerant-12 to make the mixture non-explosive; working concentrations are typically 400-600 mg EtO per L of vessel volume. When the sterilization cycle is complete, the gas is removed from the chamber by a vacuum pump. While EtO scrubbing is similar to conventional gas scrubbing, a longer residence time in the scrubbing unit is required because of mass-transfer and reactivity constraints. The unit is based on the absorption of EtO in solution, and its subsequent hydrolysis to ethylene glycol — common antifreeze compound. Reaction rate is a function of temperature and the presence of a catalyst such as sulfuric acid. Energy consumption is minimal. The final product is an ethylene glycol solution containing a small amount of acid. Single-Stage Design: Overall scrubbing capacity of the units depends on the amount of gas being discharged, which in the case of EtO Sterilization, occurs only intermittently every 6-16 h. The systems are each sized to handle 600 ft3/min of gas, with 99+ % EtO removal. A single-stage tower, with high-performance polypropylene packing was sufficient to carry out the absorption. This is followed by a reactor vessel, a piping loop and recirculating pump. The towers have diameters of 24 in. (i.d.) and are 28 ft tall; the height is not a problem since the towers can be installed outdoors. Scrubbing solution flows countercurrently down the towers, while offgas rises. A mist eliminator at the top of the packed bed prevents entrained liquids from escaping with the vent gas. After the reaction is complete, the solution is diverted to a holding tank, and when this tank is nearly full of glycol, a disposal company is called in to drain it. Clean Air Group scrubbers have been used in a variety of applications, including acid gases, ammonia and sulfur compounds. The firm also supplies vacuum-based process equipment.